Dentist: So, what can I do for you today? Patient: I’ve got a broken tooth. “It looks like this tooth needs a filling or a crown.” Occasionally the patient will say, “Fine, just tell me the best thing to do, and I’ll do it!” On the surface that seems like the ideal response, but let’s see how that answer can cause problems. Patient: How much is the crown? Patient: I’ll need to think about it. The logical thing to do now would be to defend your decision, and try to convince the patient they need a crown. And in doing that it’s easy to come across as being pushy, and trying to ‘sell’ procedure. And guess what? You've snookered yourself. 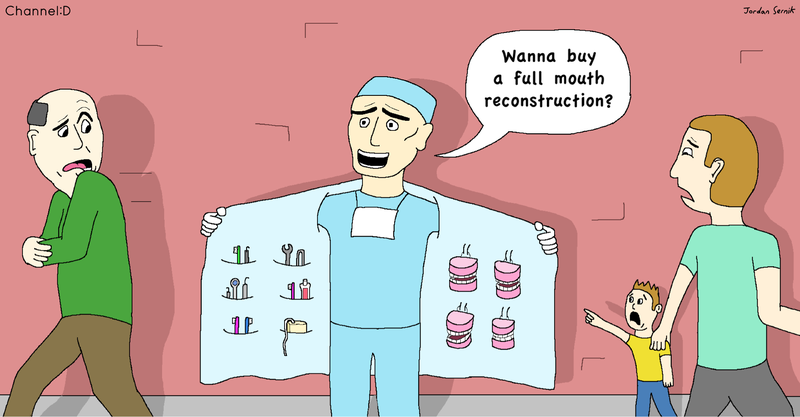 The number one complaint on review sites like Yelp is “The dentist tried to sell me treatment that I didn’t need!” Getting criticized on these sites can crush your business (game over). A lot of ethical clinicians are getting smeared because a patient misinterpreted a well-intentioned recommendation as “sales pressure”. So, once you hear “I need to think about it”, you should probably take the hint and don’t push your luck (or your agenda). When you’d digging yourself a hole, the smart thing to do is stop digging. If the patient had been handled differently, there might have been a better outcome. It’s important to remember this important fact. The treatment decision a patient makes is dependent on their level of concern. Get that idea clearly in your head because it’s critical. The earlier you know their level of concern the better. That’s because it gives you clues as to what sorts of things you need to say. Here’s a suggested method, with a greater chance the patient will choose optimal care. You need to use your own words to make this strategy work. Step 1. Before you make recommendations, determine their level of concern. This open question may give you some clues as to the patient’s concern. If you still don’t know, ask a polarized question. This is a question with two extreme positions. If it's said exactly like that, most people will choose one category over another. If they say that, go to the next step. Step 2. Lay the patient down. Have a look around. Don’t do any charting yet. Take a photo of the tooth. Step 3. Sit the patient up. Load the photo onto your computer monitor and position the monitor so the patient can see the photo. Step 4. Say to the patient, “Excuse me for a moment while we write some notes onto our records”. Now ask the DA to take notes as you describe in simple language what you see. You are talking to the DA, not the patient. Since the patient is a passive observer, they’ll be better able to understand and absorb what’s happening. This is all said clearly in simple language. The purpose is to have the patient see the problem and hear the description of the problem. Don’t speak to the patient. You are speaking to the DA. The whole purpose is to have the patient overhear and understand what’s happening. Only describe what is clearly, irrefutably visible. Step 5. Lay the patient back down again if necessary and complete the charting. Try to do this efficiently. This gives the patient time to absorb what’s going on. Since you’ve described both the problem and also described the consequence of the problem, the patient still doesn’t know what the treatment solution is. This usually makes them curious. Typically, they’ll be asking you what can be done. Most patients will describe their problem accurately because they overheard and saw you describe everything a few moments ago. The advantage of this method so far is that we have sequenced the problem and its consequences before offering any solutions. When the patient describes their problem, you can be 100% certain they believe the problem exists. The act of them describing their own problem is infinitely more effective than you describing it, and asking them if they understand. So, don’t jump into making recommendations prematurely. Before discussing solutions, the patient needs to be completely convinced that a problem exists. The best way to be sure that they really believe the scale of the problem, is for them to describe the problem in their own words. People believe what they say, not what they hear. If you can get the patient to tell you what’s happening, that’s when they’re really ready to discuss solutions; but not a moment before.